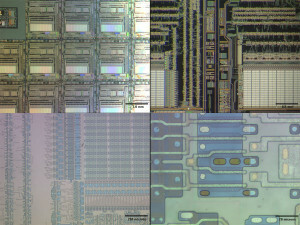 Optical microscope images of microelectronic devices at various magnifications. Optical microscopy, with a history that spans five centuries, is too often overlooked as a fundamental tool by surface analysts. Modern optical microscopes are capable of capturing contrast detail from most surfaces. Lens design has allowed sufficient image brightness that detail can be readily resolved near the optical limit of resolution (0.25µm). Use of a range of on- and off-axis incident light beams greatly extends the possibility of topographic contrast. Our three optical microscopes, capable of magnifications ranging from 6.5 X to 1000 X, are interfaced to a high-resolution colour digital camera that allow capture of digital images. Examining samples by optical microscopy aids us in determining which technique will be the most suitable if further analysis is required.